Robert Speller, Alessandro Olivo and colleagues from the department of Medical Physics and Bioengineering at UCL have developed a novel phase-contrast x-ray technology. 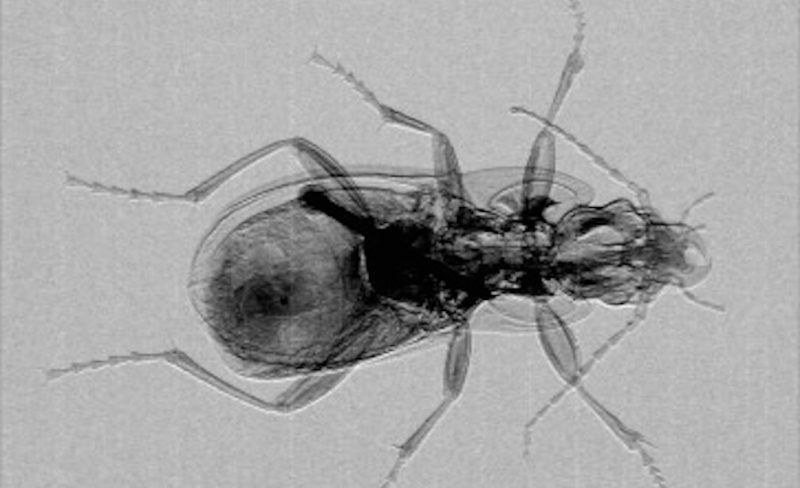 Recently featured in the Research Highlights section of Nature, UCL’s x-ray phase-contrast imaging represents a significant improvement from conventional x-ray imaging due to the substantially increased visibility of fine detail. UCL’s refraction-based x-ray phase-contrast imaging converts phase effects into image contrast by means of a system sensitive to deviations in the directions of the x-ray beam. A conventional x-ray source fitted with offset pre- and post-sample coded masks can select the portions of the x-ray beam actively contributing to the deviated signal, maximising signal detection and filtering out background noise. Images generated to date are strongly supportive of the use of this technology for materials science, non-destructive testing, security inspection and medical imaging. Conventional x-ray imaging technology relies upon the differential absorption of x-rays, however soft mammary tissue has poor absorption and so breast images suffer from bad contrast, resulting in low-quality images. Small changes in soft tissue such as those that occur in breast cancer do however cause a significant phase change in the x-rays. UCL’s system can detect this phase change, giving better image quality than is achievable in today’s mammographic systems and hopefully leading to improved clinical diagnosis. ‘Applied physics: Better X-ray vision’, Nature, Vol. 472, p 392 (28 April 2011). Alessandro Olivo, Konstantin Ignatyev, Peter R. T. Munro, and Robert D. Speller, ‘Noninterferometric phase-contrast images obtained with incoherent x-ray sources’, Applied Optics, Vol. 50, Issue 12, pp. 1765-1769 (2011).